They write: “The world can be divided into 2 types of people: those who love ghee and those who haven’t tried a good Grass-fed Ghee. Pure Indian Foods has been helping people jump to the first group for 5-generations, since 1889. 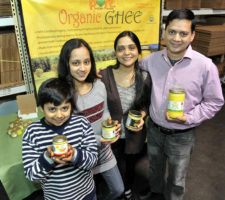 Pure Indian Foods is a family-owned business based in New Jersey that makes over 11 varieties of grassfed organic ghee products. Pure Indian Foods focuses on quality and not on quality. Thousands of customers (moms, foodies, chefs, healthcare practitioners) have put their trust in our ghee products. Give us a try. You won’t be disappointed. Grass-fed 70 Markets “grass fed” but is not 100%; they only use milk produced during the grazing season.